I must confess that I did not recall until I saw a commemorative posting on the Prince Harry Facebook page that today is the 15th anniversary of the passing of Princess Diana. I, like everyone else was totally shocked when that happened. She got married 3 months after I had given birth to my daughter and I watched the ceremony on a little black and white Sony TV. I loved her sense of humour and I liked following her stories. I saw her in Edmonton once and shook her hand. She was opening the new police station, the Divisional HQ. There were not too many of us as word did not get around until near her arrival and I only found out in passing. I worked in Central London so I joined the queues with a work colleague and laid a floral tribute at Kensington Palace. I cannot remember which flowers but I know there were sunflowers and I threw a little Egyptian pendant that I had through the gates surrounding the Palace as a sort of token gift for safe passage for her and Dodi. I watched the funeral on TV and then went by public transport to the Institue of Psychosynthesis as I was doing the Fundamentals course over that weekend. The train stopped at one point on the way to Hendon and the Diana’s car passed on the way to her resting place. There were eight of us at the Fundamentals course and the faciliators said that it would be a deep experience as we were all particularly open to sharing things with strangers at that time, as was most of the country. I went to Kensington to walk around the Gardens a week after the funeral as I wanted to be alone with my thoughts and just take it in, including my experiences at The Fundamentals course. I heard a bit of a squawking rumpus on one of the lawns as I walked along a path but for some reason I remained focussed on my thoughts and did not look. Suddenley two young boys, maybe aged 12ish came running up to me. They were saying “Madam! The bird! Come and help the bird!” What? I thought, They were anxious, insistent and pointing to an area of the lawn where a small crowd was gathering, mostly teenagers, tourist teenagers taking photos of something. I followed the boys and looked in horror as I recalled the sqawking rumpus. On the ground there was a crow laying on its back alive, injured and it was being attacked by four other crows. 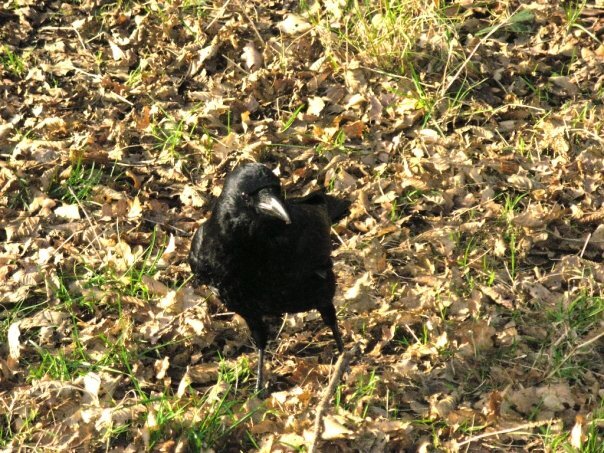 The spectators were snapping close range pictures and doing nothing to help the injured crow. All I could think of was how absurdly inappropriate and insensitive it was that this should be happening at Kensington Palace, people photographing the crow dying especially in the early aftermath of Diana’s death, the manner of her passing and the hordes of press who took photos. I cannot recall exactly what I said but I managed to diperse the crowd and the crows who were reluctant to leave the injured one without a fight. They did go. Details are a bit hazy but I do not think I was in the mood for any refusals and they flew off sounding their beaks off at me. The poor victimised bird was beyond help and I sat by it until its shallow fluttering breathing had stopped. Then I thought that I could not just leave it there. The crow gang were probably watching from the trees and might come back or more people might photograph it. I did not want that. So I walked around the perimeter path found a magazine on a bench. I picked the bird up, placed it in it and carried it until I found a bin. I did not know what else to do. I laid it in a bin in the magazine and put some things on top to protect it. There were some police officers outside the perimeterof the Palace and it did strike me that I might look a little strange walking about, picking up a magazine and poking in a bin but I had to do what I had to do. After that I went home and pondered what a strange incident that was. This entry was posted in Animal Work, Dreams, Language and The Unconscious, Magickal Workings, People, Reiki and Energy Work, SOW School Of Wyrdynamics and tagged crow, Kensington Gardens, paparazzi, photographers, Princess Diana. Bookmark the permalink.